"Dark ominous storm clouds are gathering in the distance over the sea. Gulls sweep the waves before the 'approaching storm', to gather a last meal before the first raindrops blow in on the edge of the squall." 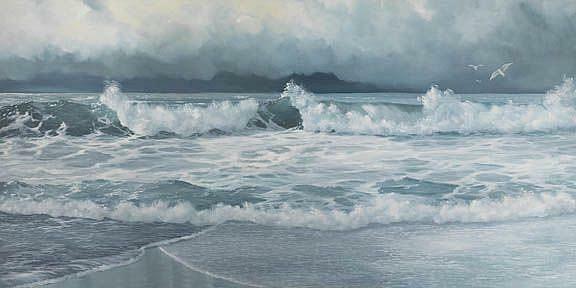 Artist Comments: "Some of my happiest times at the seashore have been just before a storm. The air seems heavy, laden with the perceived power of wind-driven rain. Skies are darker, more intense, as the last vestige of sunlight is nearly obscured. This oil painting depicts one such moment in time on the Pacific Coast of the Northwest, just before the weather front unleashes its full fury. Then people and animals and shore birds seek shelter to wait out the torrents of rain and the lashing of the wind from the approaching storm." This image is available as a limited edition giclee print on paper and canvas from an original painting by Carol Thompson. Edition length is 3600 authorized, signed, limited edition prints (3500 numbered and 100 artist proofs). Please visit my website for prices and/or availability of the original painting.